“Hack” like a programmer in movies and games. 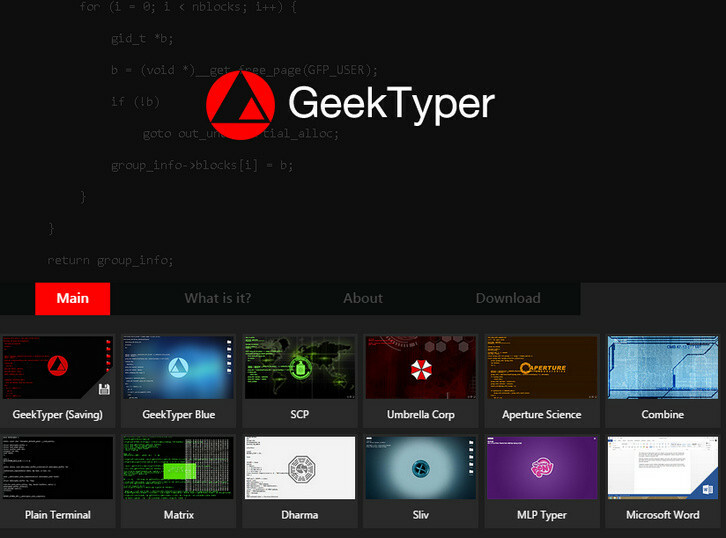 GeekTyper was inspired by the various media where hacking is usually portrayed incorrectly. Simply randomly mash your keyboard and code will display on your screen. Press TAB to display hotkeys that activate various effects. The “hacking” isn’t real, and everything you type isn’t stored anywhere. Your preferences are stored in your browser’s cache. I do believe hacking is an art. Its not meant to harm the system but an art to get known with the system well. Enjoy hacking! Hacking is definitely art! It is just not understood by society. This is a good step in the right direction. Start typing random text to simulate that you’re hacking a computer system. Start typing random text to simulate that you’re hacking a computer system.Maybe you have a reputation as something of a computer genius. Some web hacks are very transferable and can work on many sites – such as SQL Injection of poorly build web sites.